A walking pilgrimage from rock to radar linking two sites focused on heavenly investigation and speculation. A slow autumnal journey observing landscape pattern and place, examining relationships and creating lines of enquiry. On the English/Welsh Border, facing North and West, high on Stapeley Hill, are remnants of stone circles. Reminders of an ancient civilisation lost to our understanding but present, embedded deep, in our imaginations. Mitchell’s Fold, the most significant and an appropriate starting point, with its story of drought, milk and witches, led a C19th vicar to carve the tale in stone, in the parish Church at Middleton, below the hill. 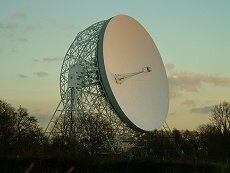 The pilgrimage crosses North Shropshire and South Cheshire to a finish at the Jodrell Bank Observatory which, with its Lovell Radio telescope (3rd largest in the world and 50 years old this year) probes into the hidden depths of space and time, gleaning and filtering, struggling to understand the past, present and future. The Observatory, engaging in imaginative games that link ancient stone circles with their present work, named one national facility based there as ‘MERLIN’ (the Multi-Element Radio Linked Interferometer Network). In such a world we can somehow almost believe more easily the reality of the Tardis. Ossified witches as a beginning, with suggestions of scientific magic at the finish, the route casts a line across the intervening lowlands. Thus are linked romantic notions, old and new, through places that illustrate a variety of developments in the history, culture and economy of Britain. The 6 days walk has a northerly course, descending on day one into the valley of the River Severn, to cross, on day two, the river by Welsh Bridge in Shrewsbury. The route passes through Hadnall and crosses the ancient and significant Grinshill ridge – presumed to be a place of significance for the hunter-gatherers whose flint tools abound here. A prized stone has been quarried here which was used to build Roman towns, castles and prime ministerial residences. Moving into Cheshire marks a change from the ridged landscape of North Shropshire onto an undulating ‘raised plain’ marked with small ponds and which slopes into the Weaver basin. The route passes through the ‘Midland Gap’ at Crewe routed along Gresty Road. Crewe is almost a living monument to the industrial nineteenth century, with its rail yards and football stadium for the curiously named Crewe Alexandra – an organisation being in its own way important and ‘classical’ – based around pubs, industry and lower division status. A railway line paralleled the route from Shrewsbury to Crewe, and continues to do so, first through the salt lands, then at Holmes Chapel and finally at Jodrell Bank. The line created by the pilgrimage began on land where the ancient is manifest both in celebratory circles born from awe, dreaming and magic and by pitted, mineral extracted hills indicative of an economy and society based on solid place and physical possession. It finishes at a location representing our continued fascination with ‘that-out-there’, situated in a region where live those heroes (and their wives!) of a present economy based on the creation of magic and dreams grown out of the games of a recent industrial past. The pilgrimage celebrates, in its own way, the sheer craziness of human imagination and aspiration. We wander in a reverie, on and on, playfully struggling to grasp who, what and where we are. No map there, nor guide. ... all is a blank before us..."
We will be self catering with accommodation as usual 'on the deck' in a variety of church and village halls. Costs: £110 for the whole walk, day rates by negotiation.